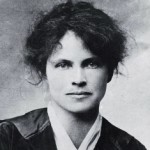 Dorothy Canfield Fisher was born in Lawrence, Kansas. She was an American educator, novelist, writer, and social activist. She strongly supported women's rights, racial equality, and lifelong education. Eleanor Roosevelt named her one of the ten most influential women in the United States. She received a B.A. from Ohio State University in 1899. She went on to study Romance languages at University of Paris and Columbia University and earned a doctoral degree from Columbia. Her best-known work today is probably Understood Betsy. She wrote 22 novels and 18 works of non-fiction. She engaged in social activism in many aspects of education and politics. She managed America's first adult education program.